The futuristic All Walls Must Fall has just been released in Early Access this week, and we take a look at what the title has to offer. 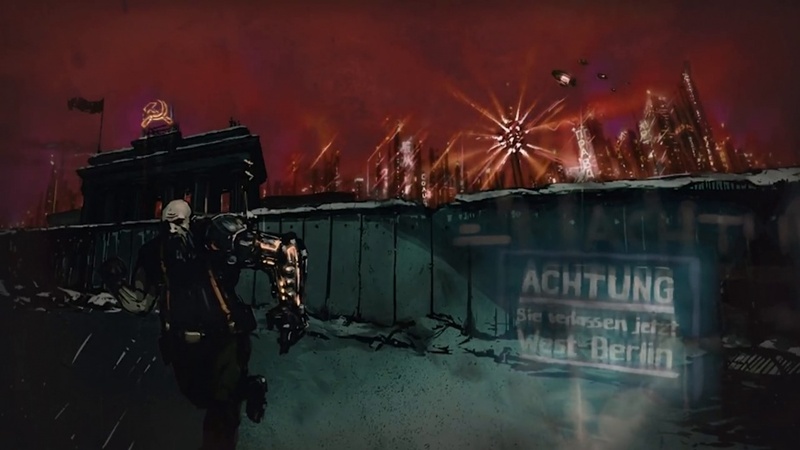 Berlin, the year 2089. The Cold War never ended and has shaped our society over the last 150 years. Meanwhile, the Eastern bloc and the West are using futuristic technology to manipulate time itself, interfering in every action of the other side. The threat of an imminent nuclear attack forces the two hostile powers to send their best agents into the past in order to find the puppet master behind all this and prevent disaster. This is the background to All Walls Must Fall, an indie roguelike made by three people at Inbetweengames. They describe their title as "Xcom meets Braid" and this comparison rings true, as they borrowed their cover system mechanics and the general strategic approach from Xcom, while Braid brings with it time manipulation. The Berlin studio then adds a Tech-Noir atmosphere to this, providing a personal touch and mixing it all into one cohesive playing experience. In the beat of the music our character Kai jumps over the dance floor in the club, because we spend most of the time in these kinds of establishments during the first part of the adventure. What Kai's role is and what motives he has remains shrouded in mystery for the time being, but in the way of classic strategy games we move our character on a grid pattern seen from an isometric perspective. What clues Kai hopes to uncover among partying guests and why we concentrate our search mainly to the night scene was unfortunately not clear to us during our session with the game, but perhaps that context is something the developers will add later on. The clubs are randomly generated and as a result you'll never enter the same room twice, so starting over (this will happen a lot) always offers something different. The random nature of these rooms, however, has its faults. For example, areas are made up of narrowly arranged objects which sometimes feel misplaced, and often we find ourselves in rooms which are very confusing from our isometric perspective, which makes the battles even more difficult. Contrary to the Xcom model where we can lose our team members permanently if we lose focus, Inbetweengames uses the permadeath feature way more offensively and invalidates our save file if we do a slight mistake. In this game time is available as a resource to us and if it runs out or if we die in a shoot out it's "Game Over" and we have to restart the entire campaign from scratch. So far, three different types of time manipulation are available. With "Undo" we can redo our last actions, which give us the perfect opportunity to look inside locked rooms without having to deal with the guards, and when using "Rewind" we wind back the time in the world around us while staying in the same place. "Trace Back", however, manipulates our own actions alone but the world and other characters remain as they are. In addition, we can carry three different weapons with us, including a classic pistol and a shotgun. Using time skills consumes precious energy, though, so we should always use it conservatively. If we kill enemies or discover new areas, we also get a small amount of our time back (literally, by the way). Despite the constant feel of danger, the tempo during each level is significantly faster than in other strategy games and combined with the ever-changing nightclubs All Walls Must Fall ensures a high replay value. If we are successful in our mission, we can visit a different club or the shop on the world map, and after clearing a level we earn points based on our overall performance which we can then spend on new weapon slots or abilities in the shop. While the Xcom series requires tactical skill, All Walls Must Fall gives us plenty of gameplay opportunities to find our own style. We can hack drones and let them work for us while we sneak around covering our tracks, for example, but if that's not your style you can also shot your way through the rooms with a shotgun and extensive use of your time skills. During the missions we often have to contact bartenders, bodyguards, or other people who provide us with information or access to different areas as well, and if we mock them during the dialogue it often turns into a fight. We're able to reverse the time during the dialogue, but since each action has its costs we should choose our answers wisely. In the conversations with our client we receive small historical snippets and background information about our mission and the world. For instance, during our playthrough we once entered a room where a guard was placed and immediately prepared for a fight, but the guy wanted to talk and we learned that the two know each other for a long time, Kai having saved his life in the past. Kai obviously couldn't remember, but these hints are well set, although they get a bit lost over the course of the game, so it would be exciting to see if Inbetweengames can make more of it than what's there now. The rewind feature is a very interesting mechanic which we simply can't get enough of. Games like Quantum Break or Life is Strange are great examples of this and show how exciting space-time manipulation can be, and All Walls Must Fall promises the same approach and integrates the mechanics into a suitable scenario. So far, there isn't much to tell you with all those little stories and promises that are given to us, but it's a foundation that the indie studio can build on. The strengths of All Walls Must Fall are currently in its technical aspects, such as the fighting and the use of the rewind abilities, but if Inbetweengames delve deeper into the story and let players take part in that there are some interesting scenarios in combination with the roguelike charm of the game. For now, we like what we see though, and we're itching to see more. All Walls Must Fall is officially launching this week via early access on Steam and Itch.io. So far, we can look at about a third of the game and explore the nightclub scene of East Berlin. In September the next big update is to follow which promises to add West Berlin.